Whether if you're a new parent or currently have kids, I would recommend this book. The book goes in detail on how to raise your baby green and organic from the beginning to the end of the book. This book is co-written by Dr. Robert Sears, a renown board certified pediatrician who also co-written a series of baby books like The Baby Book. 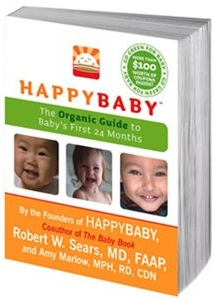 HappyBaby The Organic Guide to Baby's First 24 Months not only focuses on the importance of feeding whole, fresh, and organic foods for babies, it also gives tips on how to make your home safer for your baby as well as how to deal with toddlers refusing to eat their food. This book has loads of information that will help keep your child healthy and make your motherhood easier. Organic formulas: Dr. Sears warns organic formulas aren’t always better, as some contain corn syrup or brown rice syrup as sweeteners. “This is not a wise nutritional move for Baby.” This was interesting because I always thought that being organic is good. Eczema or Other Rashes: Switching to organic cotton clothing will help get rid of eczema and rashes on the baby. As a teacher, I have seen children come in eczema and rashes and the parents have no idea what is causing them. This will be good information for the parents to know. Prize: One lucky reader will be receiving a copy of HappyBaby's Guide to the first 24 months book, coupons for HappyBaby products (1 each), HappyBaby recipes, HappyBaby Nutrition Guide, and HappyBaby FAQ. 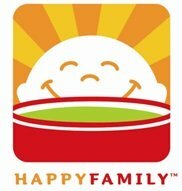 I would totally love to try the salmon stix with my nephew...he loves the happybaby pouches! they were a life saver this past week as he was cutting 3 teeth while traveling! Just staying home and resting. I am interested in the recipes but because I love to try new ones.